We are Arrow Auto Centre, a family run service, MOT and repair centre established in 2005 in Farnborough. We are an approved RAC repair centre and an official Forte additive and cleaning system service centre. We understand your car is your pride and joy, and it’s essential it starts first time, every time. We know your time is precious, that’s why we do things differently around here. We don’t expect you to know every detail about your vehicle, so we don’t do ‘mechanic speak’. If there is a problem, we will explain everything in detail, and if something needs fixing, we will show you what’s wrong and why it needs replacing. No work will be carried out without prior agreement so no nasty surprises. Our technicians are all fully qualified and have over 50 years of experience in modern vehicles between them. MOTs (class 4 by appointment). On Car Petrol and Diesel Injection, Turbo, Inlet System and Diesel Particulate Filter (D.P.F) Cleaning Using Fortes Latest Specification Electronic Cleaning System. We also carry out full diagnostics on all vehicle electronic systems using the latest ‘Snap-on’ system. It’s a smart piece of kit that regularly updates with your car manufacturers latest specifications, meaning issues are found faster. We do not charge for basic diagnosis. Few drivers are aware of the change in EU Law regarding fuel emissions, but we’re on top of it. 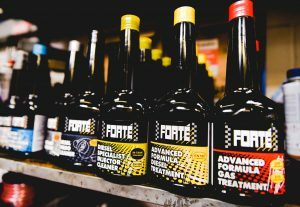 Forte Additives and Electronic Cleaning System. To flush and clean your diesel or petrol vehicle to make your engine run cleaner, smoother and more economically and to lower emissions readings to help bring your vehicle in line with the new MOT emissions laws. 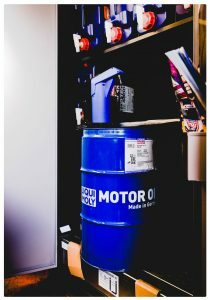 To prolong the life of your engine by using the latest German technology in oils and lubricants perfectly suited to your individual vehicle. We’ll help ensure your vehicle is 100% roadworthy and running as efficiently as possible. Our services and MOTs can be quick so you could sit and wait if you wanted to in our comfortable waiting area where you can relax use the free Wi-Fi and say hello to our resident dog, Chino. She’s super-friendly and a big softie. Our regulars adore her, and we’re sure you will too. However, life is hectic. There’s the school run. Appointments. Shift changes, and any number of things that crop up so we will endeavour to do our best to fit your vehicle in at the most convenient time for you whether early morning, lunchtime, late afternoon or Saturday morning. Chino can’t wait to meet you! Your car is your pride and joy, and we’ll make sure it’s back on the road in no time. Show your vehicle the love it deserves by booking your service today. However, act fast, we take on new business every day and advise booking at least a week in advance.